No. I am not a lush who takes shots before heading out on my 50 mile commute. Let's just get THAT out of the way! Although, some days...... HA! BUT...I get out of the shower this morning and grabbed a kleenex to wipe something down and notice there is blood on it...that's odd. Then I notice that there is actually quite a bit on my hand. That's even MORE odd. I figure it's a hang nail or something and turn to the sink to wash it off and investigate. Upon getting to the sink and viewing the reflection in the mirror, I find that it is not my hand bleeding, but rather my FACE! There was a tiny dot thing on my face yesterday, you see. It wasn't a zit, or at least, didn't seem like one. It was red and looked like a tiny blood blister or something. I have no idea how one would go about getting one of those on one's face, so I just figured whatever it was, it would work itself out and go away in time. That works for me. HOWEVER...apparently when I dried my face off after getting out of the shower, I must have caused it to start bleeding. Fine. I grab a tissue and dab a bit. It won't stop. Seriously? So...I apply pressure. Pressure stops bleeding, right? Right. Not right. Pressure did precisely nothing. Just say'n. SOooooo....hydrogen peroxide. Got it. Pulled that out from under the sink and applied. Yup. I went to the freezer, pulled out a bottle of Absolut Mandarin and attempted to use THAT to stop the bleeding. Yes, it stung a little, but not NEARLY as much as I thought it would. Rather disappointing, actually...very UNlike the movies. Just say'n. Did it work, you ask? Of course not. That would have been too easy. You know...vodka is ALWAYS the easy way out, right? No? Hmmm....I didn't think so either, but apparently, my morning fun still had no end in site. I was seriously wondering if this was just going to bleed all day long and then began considering how much blood loss that would actually be....HA! Styptic Stick. Do you own one? If not, go to the pharmacy and buy one! I had forgotten about it until this last desperate moment, but then I finally grabbed it from the medicine cabinet and, after three applications, the bleeding finally stopped. Whew! It was rather insane, I tell you! But, anyway, that's why I may have shown up to work smelling a bit like Absolut Mandarin. Just say'n. Now...onto my workspace...this is a phone shot, so I had to lighten it up a bit and it is still kinda dark, but it shows my fun desk right now! You are looking at a stack of some fresh new Skipping Stones Design stamps that I am super excited to play with and there *might* be a set for me to giveaway in that pile, too. Hmmmm.....something to consider. You also see some fun goodies from Creative Impressions that will be in my work soon AND a couple of sketches that I already completed, but may do again this week 'cause I kinda like 'em. Just say'n. And here is a little card that I wanted to share, as well. I stitched the accent with variegated embroidery floss to get the flow of color and then used two ink colors to get a nice ombre type look on the sentiment. 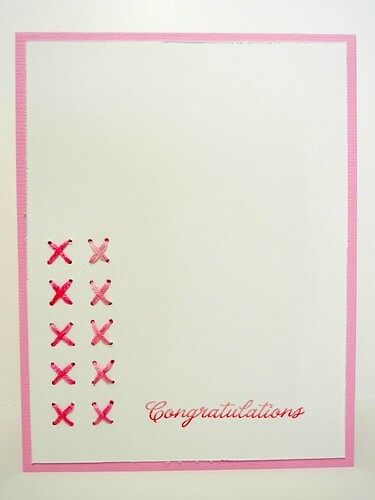 Just a pretty little Congratulations card. I am linking this up to the My Time To Craft Quite White challenge! So, that's all for today. Although, I would imagine that vodka, a pink cuteness card, and my crazy workspace is quite enough. HA! Happy Wednesday! your card is just too cute! love the stitching! And that's just the middle of the week!? I'd curious to see by Friday what's up, LOL. As always, I enjoy seeing your art desk, although for a laugh you should have put the vodka bottle and a glass sitting in the mess:) LOL. Glad to hear that the story didn't end with hospitalization! Put a bandaid on in case there are vampires lurking....(grin). Have a great rest of the day Jennifer, and drink some orange juice with the next shot....I'm just saying! Understand about the desk:):) Love the simple card~love simple!!!! Your card is fun. Glad you are okay. Okay first, I would have taken a shot of said vodka just because you had to go through all that...second, did you not think to use Adirondack ink/ alcohol blending stuff..I think it is just alcohol...and it could of been considered crafting just maybe lol and Last I love your card, very sweet and clean and pink..I love Pink! so glad you got that bleeding under control! we would have hated to lose you! Thats not the best ways to start your day. Poor you. So did they buy that story? Amazing how a little thing can just bleed! Sweet card, love the stitching! Love the white card and the stitching! Very nice! OH MY...I would have looked inthe mirror and my wild imagination would have thought that "something" had gotten me and then I would have fallen dead in the floor...no...not really but sine it's Halloween time I thought it sounded cool. (yeah..wayyy to much coffee this morning I think)I'm so happy you finally got it to stop bleeding. YIKES..that would have made for a very long day at the office!! Love the card...I really like how you use different items to make them POP!! Love all the things on your desk too...you always give inspiration by letting us peek!! Your post titles are to funny! Lovely card, just right for our challenge at MTTC this week, thanks for sharing. What a way to start your day, but you have a great story to tell. Cute card! Love the cross stitching. quite a morning you had! Hope you didn't get funny looks! gorgeous card, love the stitching! hmm, you need to get the blemish that bled checked out by a dermatologist please. You should NOT need to cauterise your face under any circumstances. went to get you your Happy Christmas stamp - ha ha ha - thereby hangs a tale (not so entertaining as yours). I will blog it Sunday as I have a stupidly busy time until then, I will mail your stamp Saturday. Hey sounds like a fun morning not!!!! Ahh vodka a girl after my own heart! Pretty card. Great looking desk..had to enlarge - like the stamps very much - and the packet of tapes - yum! Glad you got the bleeding under control...getting to work with a floppy face is not as good a look as a perfume of Absolut Mandarin.....funny you should mention it...we were erm..employing Absolut Raspberry to parched throats at the weekend - I recommend that as a treatment!! You should have just drunk the vodka and then you would have forgotten about the bleeding!! Pretty card tho and you could have used white cotton thread and then turned it red!! LOL!! That's crazy!! What was it? A blister? I had a little blood encounter yesterday when my son (age 6) got a bloody nose, freaked out and somehow got blood all over the place. My bathroom looked like a crime scene. Then I discovered he got some blood in the carpet. So I now have in my computer history a search term for "how to get blood out of carpet." I hope CSI doesn't investigate me! 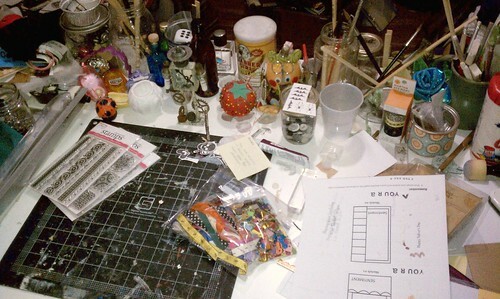 You've always got a creative mess going on, on your desk! LOL. Your card is simple, but very attractive. Love your card, sweet and simple. gosh, for a while i thought it was something serious. glad you got it under control! seems like you could use those stamps in a lot of projects. thanks for sharing! Your story is told so humorously but I am glad you were able to stop the bleeding eventually! I wonder what that was all about? Your pink and white card is simply perfection! Very clean and simple and pretty! Wow 50 miles to work, how long does that take you? As for your blood gushing face. I remember someone told me (when I was young) that if I picked off a birthmark I would bleed to death. Alwasy wondered how long that would take out of that little hole, lol. You're so funny! I did the desk-cleaning thing this week, too! Glad you managed to stem the bleeding in the end. We do have one of those styptic sticks, but it is in the dog first aid kit, supposedly to stop bleeding when we cut the dog's claws to close. It does not work there, probably because it is very difficult to keep an energetic dog still long enough to apply it properly. Those cards are so pretty and effective. Thank goodness there were no vampires in the room ... LOL ... too funny! There are worse things you could smell like. The variegated floss is pure magic! Hey I'm with Boone. You should get that thing checked out!! Love your orderly desk! Ha! My whole house looks like that right now... what a bad order week example I am!! The same thing happened to me once when we were staying with my parents. I knocked the top off a tiny mole on my neck and was panicking because it just wouldn't stop bleeding. My dad lent me his styptic stick and it stopped it! Weird how the clotting mechanism doesn't seem to work on some of these little things, isn't it. Hi, I'm here for the first time, but I have to tell you that your card is amazing!!! So simple and so beautiful!